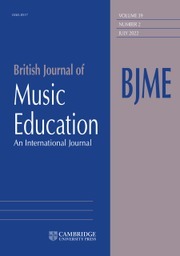 BJME is a fully refereed international journal, which provides clear, stimulating and readable accounts of contemporary research in music education worldwide, and a section containing extended book reviews which further current debates. The journal strives to strengthen connections between research and practice, so enhancing professional development and improving practice within the field of music education. The range of subjects covers music teaching and learning in formal and informal contexts including classroom, individual, group and whole class instrumental and vocal teaching, music in higher education, international comparative music education, music in community settings, and teacher education.